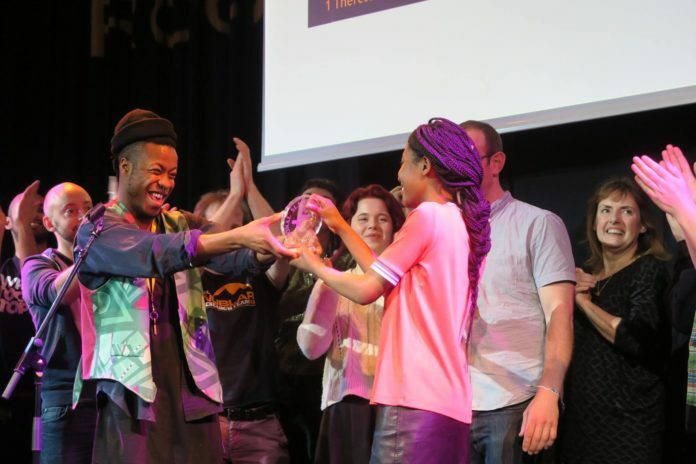 I had watched countless videos on YouTube, attended other poetry slams and kept abreast of the ‘scene’ on social media, but nothing quite prepared me for the electricity in the air when I arrived at the Royal Festival Hall for the hotly-anticipated National Finals of Hammer and Tongue’s annual spoken word circuit. The tension, after all, had built over several months as teams selected in the gruelling regional stages made their way to the national qualifiers, and nothing – neither the drizzly January afternoon, nor an imminent city-wide Tube strike – would dampen anyone’s spirits. Some poets spoke to the politics of the moment, finding broad currency for their observations on divisive issues. In the quarter-finals, A.P. 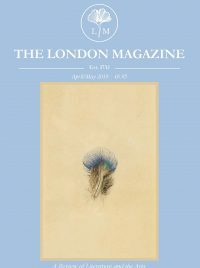 Staunton’s ballad about an unravelling relationship astutely plotted the fault-lines between young and old on the far left – and took him through to the semi-finals where he redeployed his winning poem from the Brighton slam, a rip-roaring confessional about urinating in a posh house-owner’s sink. Taking the opposite tack, David Macpherson’s witty quarter-final performance satirized himself as the quintessential ‘Facebook-friendable’ millennial, while Alison Absolute tempered her long lament against political folly with memorable barbs about how, for instance, pro-life campaigners believed that ‘a woman’s right to choose is just / her right to get it wrong’. Others capitalized on the sheer force of personality. Cambridge’s unashamedly geeky champion, Robin Lamboll, breezed through the quarter-finals with his poem (previously performed at TEDx Cambridge) on the causes and consequences of irritable bowel syndrome, ruminating on its many similarities with the creative process. Not to be outdone, Oxford’s runner-up, Dave Allen, offered a mirthful take on the metaphysics of missed opportunities behind his own existence, and also swept through to the semi-finals. Neither drew quite the same reaction from the audience at this stage, however, as Anna Beecher’s inventive tale of grief-stricken honey bees after their beloved beekeeper’s death – ‘though nobody likes telling the little ones’, she said wryly, ‘the little ones always know’. But the poems which resonated most with the crowd, and also found most success with the judges, were those which channelled their poets’ deepest fears and hurts: proving again the principle that there is something universal in pain, and our attempts to pull a brave face at it. Sez Thomasin’s heartbreaking poem about losing her child – which compared the struggle of reconciling herself with the loss to finding meaning in ‘stars that aren’t even close to each other’ – came close second in the semi-final to Theresa Lola’s poem about her grandfather’s dementia (‘this pompous disease’), a piece she previously described as ‘the most honest poem’ she had ever written. This correspondent found himself most grateful for the dimmed lighting in the Elgar Room as Sven Stears narrated, with searing honesty, the grief and rage of caring for a gravely ill loved one: for both of them, ‘every day was Everest’. Founder and President Steve Larkin took the stage himself just before the grand finals to look back at Hammer and Tongue’s thirteen years on the scene, celebrating how the network had established itself at the heart of a thriving circuit, and birthed communities in Brighton, Bristol and Cambridge, among other cities. His own poems, to everyone’s delight, championed the place of ‘living, breathing’ poets in the limelight over dead ones, and raised a proverbial fist against a poetry establishment where ‘they’re scared of an artist around here / who can speak his mind back without fear’. These were the perfect introduction to the 2016 champion, Solomon O.B., whose powerful guest performance did just that: fearlessly retracing the fresh wounds of words used carelessly – how a racial slur, even when used by a well-intentioned foster-parent, was still ‘less than’, still meant ‘three-fifths of a man’. 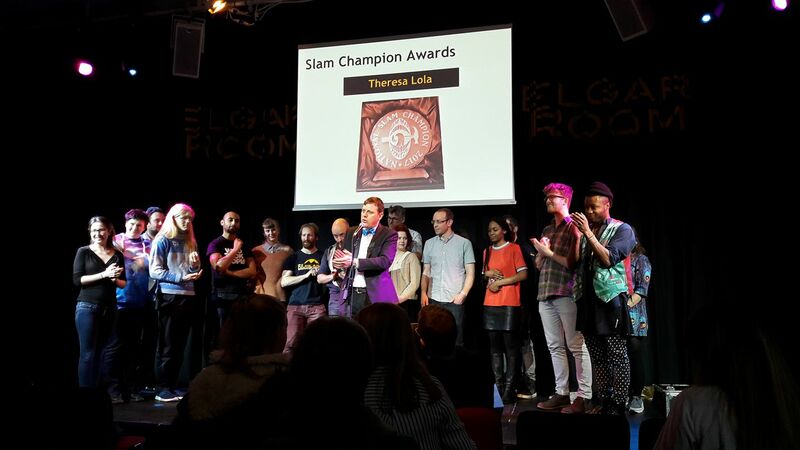 The final slam, a fitting conclusion to the afternoon of diversity and daring, was pure gold. All five poets – gamely ushered in by Cambridge’s Fay Roberts – were clearly masters of their art, and represented such different styles and approaches to the form that each, as Solomon pointed out, would have been a worthy winner. Macpherson urged the audience to join him in ‘standing bare, clothed only in dreams’, Allen thrilled the crowd with a titillating take on a chance encounter at a slam evening, Lamboll performed an encyclopaedic pastiche-poem on science and religion, while Tom Denbigh delivered a humane anthem on why ‘Gay People are Apparently a lot like X-Men’. But the star of the afternoon was Lola, who returned to the stage to weave politics, personality, and pain into a devastating poem about sexual assault. By the time she arrived at her penultimate line – ‘no-one can see a body in a dark room unless they hear a voice’ – there could not have been a dry eye in the room. There are few better validations today of Coleridge’s quip about poetry’s definition as ‘best words in their best order’ than the ever-expanding horizons of Britain’s spoken word artists. Besides reviving a genre in the public eye, they have brought together – and continue to celebrate – an unprecedented range of different ways of living, and are steadily, courageously, re-shaping our common language in the process. It’s time we accorded the stage the same careful attention and support that we offer the page. There’s too much we stand to lose if we don’t.